Hi! I have TWO boxed sets (Volume 1 and Volume 2) of James Bond 007 DVD movies for sale. 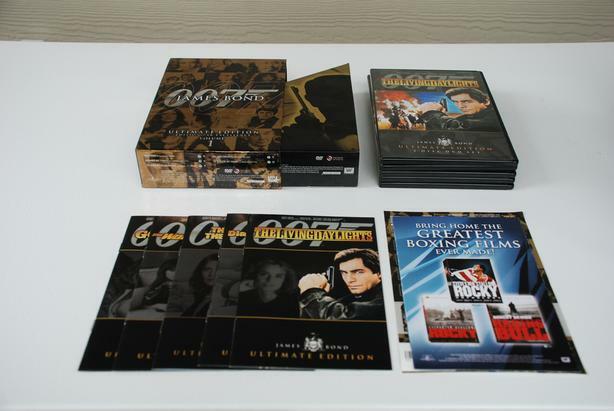 Each boxed set contains 10 DVDs x 2 = 20 movies and is part of the Ultimate Collection series. All the promotional materials that originally came in the box originally are still there in pristine condition. There are special features including behind-the-scenes footage, biographies, screen tests, and archival documentaries. Each DVD is in absolute mint condition - only the shrink-wrap has been removed but they have never been watched. I purchased these DVDs as a gift for my husband who was staying in a hospice facility until he passed away from cancer. He loved James Bond movies so much and it was my hope that we could have some fun and help pass some difficult times by watching them all together. Sadly, we did not get that chance but that is why these DVDs have been opened but have never been played. Now they serve as just a sad reminder for me and so I wish to sell them on to a new home where they can be properly enjoyed and appreciated. By the way, I have already sold Volume 3 and Volume 4 in this series to two separate buyers and they were both very happy with their purchases. You won't be disappointed. I am asking $30 for both of these mint condition DVDs together. I am located in Vancouver, BC but shipping is no problem. I will be happy to mail these DVDs to you using CanadaPost and Interac bank transfer. So, if you are interested in purchasing, e-mail me and we'll figure out the logistics and/or I can answer any questions you may have. Thanks!